Buying a pool pump, like the Intex Pool Pump, appears to be a complicated task. However, if you own a pool, purchasing a pool pump is necessary. If you research the pool pump that is idea; for your home, buying pool pumps can become an easy task. You would soon realize that there are a variety of pool pump available on the market. If you want things to be less complicated, you should opt for a brand that is known for its quality. Despite the number of choices, you would want a brand that can make you feel confident in your purchase. Excellent performance and supreme quality are some of the things that Intex Pool Pump can offer. The first Intex Pool Pump that we have tested uses the clear sand filtering method. It uses an all-natural sand filtering system with a sand capacity of 120 pounds. This allows for cleaner and clearer pool water due to the filtration process used. There are six functions to this pool pump that you can control. The system allows you to filter backwash, rinse, recirculation, drain and close the system that is being used. Moreover, it has a pump flow rate of 3,000 GPH and a system flow rate of 2,450 GPH. 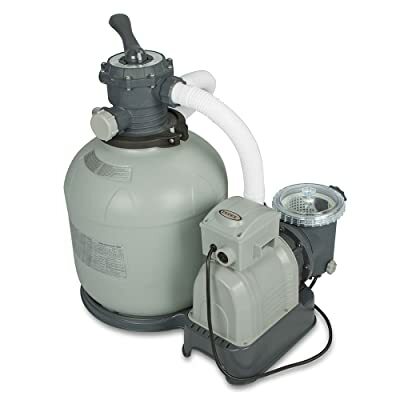 The ideal pool size for this pool pump is between 5,500 to 19,600 gallons. If you’re looking for a pool pump that can easily clean your swimming pool, this product is a great place to start your search. It comes with a 24-hour timer to ensure that the cleaning process requires minimal effort from your part. This timer allows for automatic operation with two to twelve hours of preset cycles. In addition to this, a strainer basket is thrown in the mix to ensure that the sand on the pump lasts for an extended period. 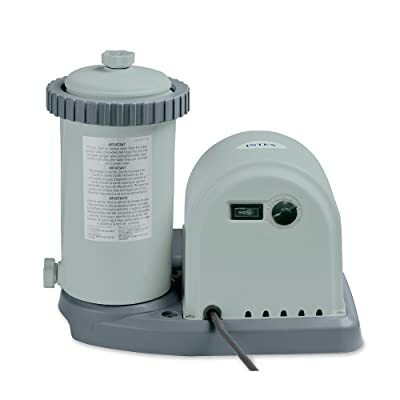 Due to the powerful flow rate of this pool pump, you can use this for larger pools. Moreover, it clears you from tedious maintenance as you will only need to replace the sand once every five years. There is also two 1.5 inch connector hoses. Additionally, this meets UL/CSA standards that allow you to feel more confident about the quality of this pool pump. Another pool pump that uses a sand filter is the Intex 28681EG 120V 16-Inch Krystal Clear Sand Filter Pump & Saltwater System with GFCI. The tank measures 16 inches while it is equipped with a 100 pound sand capacity. It is ideally used for pool with a minimum capacity of 4,800 gallons and a maximum capacity of 15,000 gallons. Purchasing this product entitles you to a two-year warranty, too. It is also equipped with a GFCI as one of its safety measures to ensure that you will reduce the chances of an electrical shock. Moreover, it has a chlorine output of eleven grams per hours. In addition to this, it comes with a control panel that gives you access to the 24-hour auto-clock cycle and a built-in timer. This is powered with 110 to 120 volts and a 0.95 HP motor. It has a durable structure with a solid built, which is also easy to store when winter comes. If you are worried about installation and setup, it is quick and easy. You do not need to exert extreme effort when installing this pool pump. For a pool pump, this can be considered rather compact as it measures 28.25 x 27.125 x 16.625 inches and it weighs over sixty pounds. 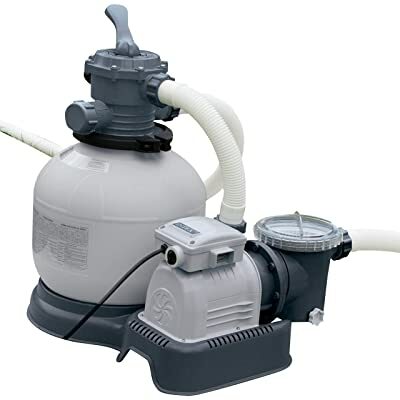 Contrary to the sand filter, the Intex Krystal Clear Cartridge Filter Pump for Above Ground Pools, 2500 GPH Pump Flow Rate, 110-120V with GFCI uses a cartridge filter to clean your pool. The cartridge is replaced every two week to ensure maximum results. It utilizes a double insulated pump and an air release valve that is meant to release any air that has been trapped inside the chamber of the cartridge filter. The filter chamber is also equipped with a sediment flush valve that is located at the bottom part. This will allow you to ensure that your Intex Pool Pump is always in tip-top shape. The Intex Krystal Clear Cartridge Filter Pump comes with a stable base and the entire tank measures 16 x 18.5 x 13.75 inches with a weight of over twenty pounds. Similar to other Intex Pool Pump, this model comes with an auto timer that can be preset for two to twelve hour cycles. Installation is also a breeze as you only need to hook up the hose before plugging the pool pump in and you are good to go. On average, this filter pump can last you for 2,000 hours. There is also a limited warranty that is able to cover any defects involving material and workmanship. If you are looking for a smaller clear sand filter pump, there is an Intex Krystal Clear Sand Filter Pump that measures fourteen inches. 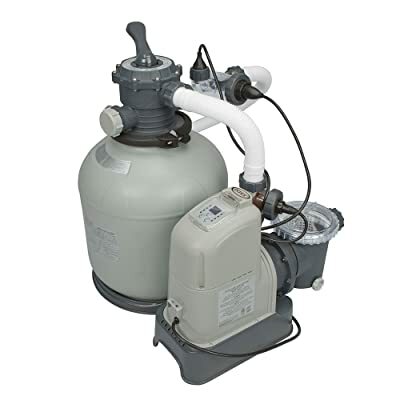 Intex 14-Inch Krystal Clear Sand Filter Pump, 110-120 Volt with GFCI uses the No. 20 silica sand and it has a 55 pound sand capacity. The filter sand that you use should be replaced every five years, which makes it less troublesome to maintain. This is best used for swimming pools located above the ground with a maximum capacity of up to 12,800 gallons. The pool pump is equipped with a leaf basket to further improve the filtering process. This heavy-duty tank is meant to perform six tasks. These tasks are the Standard Filtration, Backwash, Rinse, Re-circulation, Drain, and Close Settings. Another feature of this pool pump that is found on most Intex Pool Pump and that is the 24-hour auto timer. In terms of capacity, this product has a pump flow rate of 1,600 GPH. On one hand, its system flow rate is at 1,500 GPH. When it comes to the structure of this product, it measures 17.125 x 34.375 x 17.5 inches with a weight of almost 45 pounds. However, this is an older model. A new and improved model is available if you want an upgrade to the features of this product. If you wish for a pool pump that is friendly to the pocket, the Intex Krystal Clear Cartridge Filter Pump for Above Ground Pools, 1500 GPH Pump Flow Rate, 110-120V with GFCI is certainly affordable. Apart from the affordability of this product, it is also one of the lightest pool pump in the market as it only weighs thirteen pounds. It uses a replaceable Type A/C filter cartridge that should be replaced once every two weeks. Moreover, it requires minimal assembly as you just need to attach the hose before plugging in. Once this is done, you can begin using this pool pump. When it comes to the capacity of this cartridge filter pump, it has a pump flow rate of 1,500 GPH. Moreover, the system flow rate of this pool pump is at 1,180 GPH. It is powered with 110 to 120 volts, which allows it to function properly for heavy-duty tasks. In terms of product features, this model comes with an auto timer with preset cycles of two to twelve hours. 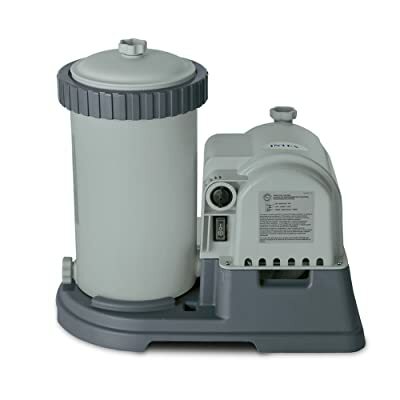 It is designed with a double insulated pump that improves the performance and quality of this pool pump. Moreover, there is an air release valve and a sediment flush valve to ensure that your pool pump will be able to work at its optimal performance. However, it is vital to remember that the plunger valves and the inlet/outlet fittings of this pool pump should be purchased separately. There are three main types of pool pumps that you can choose from. We can classify them as a two-speed pump, a four-speed pump, and a variable-speed pump. It operates in high speed when it is undergoing the cleaning process and the low speed for daily filtration process. You will usually find this on older pools, but it utilizes an automatic controller for its operation. There are different levels of pump speed, which can be utilized depending on the capacity and needs of your swimming pool. The four-speed pump is best used for swimming pool that requires a variable flow rate. You do not need to use an automatic controller for this pool pump. In addition to this, it is utilized to allow your pool pump to work at an optimum speed. If you are not a pool pump aficionado, some of the terms in this review might have confused you. This is why we have decided to break down some of the terms that we have mentioned. This is a safety device that automatically turns off your power circuit. Shut off happens whenever the current is going along a path that it was not supposed to take. This protects you from potential electrical shock. This is the measurement of how many gallons can be pumped by the hour. This shows the time that the pool pump can cycle through the water of the pool with the use of a filter. When buying a pool pump, you need to be certain that the minimum turnover should be met or exceeded by using the as minimal energy as possible. This is the amount of resistance that has been produced by the plumbing of system of your swimming pool. Quantity is measured by either feet of head or feet of resistance. This is a measure of how much opposition to water flow that your system was able to produce. To make matters worse, you might need to be a math wizard to calculate your pool pump needs. However, there are swimming pool calculators online that can easily do the computations for you. We will also show you the equation, in case you want to do it yourself. Before purchasing a pool pump, you can refer to this buying guide to ensure that the pool pump that you will use is suitable for the needs of your swimming pool. Homeowners who are new to this pool filtration process might find this review convincing. While it is true that most Intex Pool Pump carry almost the same benefits, each model is still different. There are pool pump models that are a notch above the others. For the battle of the Intex Pool Pumps, the clear winner is the Intex Krystal Clear Sand Filter Pump for Above Ground Pools, 3000 GPH Pump Flow Rate, 110-120V with GFCI. In terms of power and capacity, it takes the cake in almost every way. The water is clearer and cleaner. It requires virtually no maintenance. The structure and built of this pool pump is solid and has structural integrity. Moreover, this pool pump is also extremely affordable, which gives great value for your money. However, the Intex Pool Pump brand has been trusted by many users over the years and we have certainly understood why. As we have tested their product, it certainly shows that the quality of their product is something that they take seriously.